Is your green thumb a little on the brown side? Do you love the idea of a growing vegetables but unfortunately do not have the room? Stitch up your own garden instead! You do not need to worry about over or under watering and your flowers will always be in bloom. From traditional to modern, the following garden themed cross stitch patterns will brighten your day and your decor. Some people feel more at home in their garden than anywhere else. They find peace while digging in the dirt. Home is My Garden is the perfect pattern for those who love getting their hands dirty. Even sea creatures enjoy gardening in their free time. Blackbird designs show off their flair for primitive style with a touch of fun in this pattern entitled Octopus' Garden. Of course the octopus would have a perfect garden since he can multitask so well. Stitch this pattern, along with other sea themes, and turn your home into a beach cabin this season. Have you always dreamed of designing your own garden? Do you love French gardens? How about English gardens? You don't have to spend one penny on the garden of your dreams with DMC's Design Your Own Garden pattern. Blackwork is a style of cross stitch that is not only beautiful, but is full of history. The pattern, Blessed Be Your Garden, by Qaryn's Design, is inspired by this type of cross stitch. The color added to it makes the pattern almost look like Craftsman's decor. Frimousse has many free cross stitch patterns featuring elves in the garden. Create a whole series for your indoor decor. Kyoko Maurka is well known for fun whimsical cross stitch patterns. They are perfect for kids of all ages. You can stitch an entire scene or separate the pattern for individual pieces. Lizzie Kate creates upbeat inspiring patterns. Dry lavender from your garden and create a sachet with this bright cross stitch pattern. Stitching Studio created a series of anthropomorphic flora cross stitch patterns that feature a serene woman. If you look closely, you will see that a beautiful butterfly creates her nose and flower petals her lips. Gazette94 shares their Happy Gardener cross stitch pattern that you can stitch for free. The pattern comes in different color variations. If you don't see one that fits your personality, create your own. The Snow Flower Diaries is well known for mixing primitive aspects into modern icons. Her pattern for The Earth Has Music shares an important message with a vintage feel. Organic farming is huge now. People care about where the food comes from and what is in it. This traditional pattern from Judy Crispens is free for download and celebrates the organic farmer. 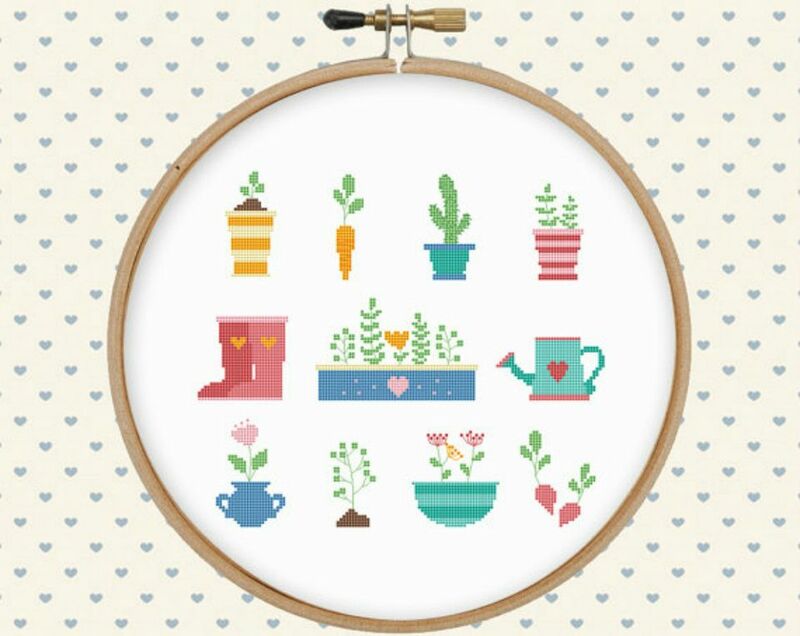 This adorable Happy Garden cross stitch pattern can be stitched up as one hoopla or as separate small hoops. The patterns would make fun buttons for your favorite gardening sweater. You have read the book, now create your own secret garden with this Secret Garden cross stitch pattern. It is free to stitch and the perfect project for beginners. This Castle Garden cross stitch pattern is very intricate and stunning. It would be a great year long project. If you look very closely at the details, you will see a beautiful garden come to life. If you are looking for a bright and colorful garden themed cross stitch pattern, look no further than this vibrant Water Can. This pattern just calls for you to drop everything and enjoy your garden. The vintage Lush Garden cross stitch pattern by WhoopiCat looks more like a painting than a cross stitch pattern. This project would be beautiful framed or as a part of functional decor, like a chair or a purse. Next to gnomes, fairies are known for fluttering around gardens. This Garden Fairy looks happy and content hanging out under a flower, enjoying her day. Gardeners know how to get down and dirty! Just check out their fingernails for the proof, This Get Dirty pattern is a fun way to celebrate the gardener in your life. Waiting for a garden to grow can be frustrating. Instead of yelling at the plants, why not stitch up this Grow Garden Grow pattern. Cross stitching this pattern will give you something to do while you wait for your garden to bloom. Gardener have a great sense of humor and most of them are Full of Crop. This tongue and cheek pattern would be a fun addition to any gardener's decor. Cross stitch this free Bloom Where You are Planted bookmark for your favorite gardener. It will make a perfect gift when paired with their favorite gardening book. What better place to meet than in the garden. Let's Meet in the Garden primitive cross stitch pattern is a wonderful nod a bygone era. Create a pillow or wall decor with the finish project. Every garden needs a mix of flowers. This Pink Poppies pattern could pass for a watercolor painting. This pattern would look stunning displayed in a Victorian sunroom. Your home can be modern and incorporate a floral display with this Mid Century Modern Flower cross stitch pattern. Vibrant colors and flowing shapes make this a perfect addition to for both modern and retro decor.